Respondents came from 42 public and private high schools in metropolitan Kansas City (in Kansas and Missouri), and in Wichita. Surveys were administered online. Surveys were administered online. Student journalists and journalism teachers completed separate surveys. 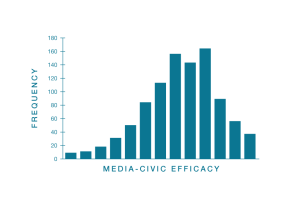 To measure media-civic efficacy, we first asked students to identify an issue they felt needed addressing in their schools or communitites. We then asked 18 questions about whether the students could effectively use their student media to address the issue they identified. Media-civic efficacy scores averaged across the 18 questions ranged from “disagree” (2) to “strongly agree” (5). Most scores clustered around “agree” (4).